The years 1890-1894 were difficult years, marked by workers' exploitation, hard economic deve­lopment, poverty and poverty, often resulting in true and real civil social conflicts and struggles. Years marked by violence, from special laws, police aggressions, dead and arrested men (like the one happened to on. De Felice during the of siege proclaimed by the Interiors Minister F. Crispi), with house arrests, searches and disarmament, suppressions of newspapers and censorship. Years of social struggles especially among the workers, in the mines, and between the farm laborers, against the masters (Pirandello, The old and the young people). 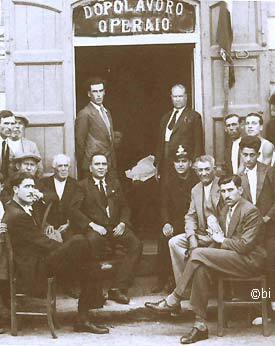 In this period all over Sicily and especially around mount Etna started to grow several working social-democrat social-republican associations. In Bronte, since 1887 had been constituted a workers association called "Circle of the Honest Workers of Bronte". The associative aims, as from art. 2 of the Statute, were: the brotherly love, the individual and collective, moral and material improvement, with education intended as the civilizing complement for the working class; the mutual aid to alleviate afflictions and needs of the members. Advanced and socially important the articles 20 and 28. The first act: "If a member after having paid for 10 consecutive years, because of old age or illness should become invalid to work, after medical certification, will receive 50 cents a day as a life subsidy". "The Council, to its discretion, may increase it". The second says: "For the perfection of arts and industries, the circle will maintain a working youngster, member' s son, in a city of the kingdom to become proficient in his art assigning a sum not greater than L.1,70 per day ". "The young son of a member will know any art well and should be between 17 and 21 years old". In the general dispositions the article 95 says: "The flag of the circle is the national one, in the middle there are two hands pressed together in a handshake, emblem of the union and brotherhood, and around, as a crown, some tools of each art with the writing: coalition, mutual aid, education". The number of the articles of the Statute-Regulation is 103. After to careful reading of the ancient Statute-Regulation one can ask himself how come that, despite the extreme poverty of the least well-to-do classes, there is not a single mention of struggles or claims. The answer could be that the wounds of the "Fatti del 1860" (The 1860 Facts) were not completely healed and that the admonition left by Bixio to the common people of Bronte could have been a goad for one turn in civil field. Obviously this is only our personal opinion. In Bronte the workers association was created in the far 1887, subsequently continued disguised as circles and cultural recreational associations. In the photography the "Dopolavoro Ope­raio" (After Work then changed in "Public Employ" and now disappeared), placed on the Corso Umberto (in front of the Capizzi college) in the years 1950. A lot of circles and associations which today still give Bronte a remarkable impulse to social initia­tives, cultural and recreational: to mention s­ome: the "Circolo Operaio" (Working Circle), the "Circolo Lavoro e Cultura Antonino Gras­sia" (Circle Work and Culture Antonino Grassia) e the secular "Circolo di Cultura Enrico Cim­bali" (Cul­tural Circle Enrico Cimbali), the ancient "ca­sino di compagnia dei civili" of 1860. The "Beam of' Nicola Spedalieri workers"
Another "Society" that, similarly to the Circle of Honored Workers, aimed at the moral and material improvement of the individual and the community, the education of the working class and mutual aid was founded in Bronte in 1892. It took its name from the first promoter of human rights, by our philosopher Nicola Spedalieri, and in his honor was in fact called the working class "Fascio de 'lavoratori Nicola Spedalieri". Following the ideas and the dictates of the philosopher, he was born with the aim of "cultivating the mind and soul of the members with instructive and moral readings and lectures on the rights and duties of man and citizen, on the fundamental laws and civil institutions ". It also aimed at "the establishment and operation of a school to teach reading and writing to those workers, who are deprived of any rudiment of education" and for this purpose the association also had a social library. 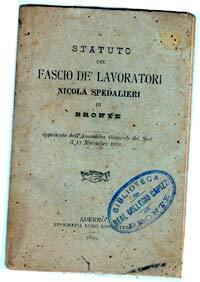 Following then the trend of the time the "Fascio de' lavoratori", in addition to the cultural improvement of the members, also had mutualistic purposes "for the improvement of the condition of the members". The Statute - 28 articles of a few lines each - foresaw that every adult member (even at the time considered at the age of 21) pay fifty cents a month and that the capital was drawn a daily subsidy (not exceeding one pound a day and no later than six months) in favor of the «sick partner, who is in absolute need». I do not know how long the working company has lasted or where they have their registered office. The Statute was approved by the members 'assembly on November 12, 1892 and certainly until August of 1895 the Nicola Spedalieri Workers' Beam "continued to operate." As for the certificate of admission and the copy of the Bylaws that we have viewed, I think that the monthly payments of 50 cents up to a given story.The Certificate had been issued a name of the "partner Isola Gaetano of Antonino, of 30 years from Bronte, of shopkeeper work, admitted in the Company there 12 November 1892" and signed by the President S Dandrea and Secretary A. Castiglione. In addition to the workers, other "social classes" can also be enrolled in the "Fascio de 'Nicola Spedalieri workers", even if they have considerable limits and only come honorary members. Strangely, the Statute also foresaw that for the honorary offices must be used to the class of professionals and those for the most important positions (that of director, deputy director, secretary, cashier and bursar) must be chosen people of the class, said in Bronte dei Civili ». The honorary president and vice-president, the director and the vice-director, the secretary, the cashier and the economy do not have the right to vote, they can say "to attend the sessions to dare their lights". Duties then of the Director, Deputy Director of the Workers' Society, to "care to nurture the mind and the mind of the members with instructive and moral readings and lectures on the rights and duties of man and citizen, on our fundamental laws and our civilizations ", with conferences held, as needed, once or twice a week. It was also their task to cure "The institute is a school to teach and write to all acts, which are devoid of any rudiment of education". 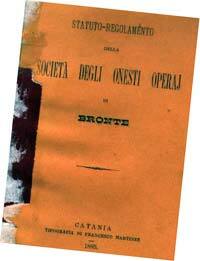 In short, not just tasks and perhaps for this reason, they were chosen "in the class, called Bronte dei Civili". And no discounts on legality. On the moral question, the Statute did not allow exceptions: it did not allow membership of "ammonite workers, nor those who were sentenced to infamous sentences" "for crimes against property and against modesty". And if the worker cautioned or condemned was already part of the association had to be "removed from the register of members" (today similar people are elected without particular scandals to our Parliament as our representatives). At least three years must have elapsed from the expiation of the sentence in order to be admitted as a member of the worker's society and those who had been warned or condemned had "given evidence of good behavior". An example for our times when we continue to talk about the "moral question", but we can not have a Parliament or a Council without more convicts or "clean" electoral lists. Each member, then, "in his interest, and for the decorum of the company and the country, must behave irreproachable" penalty "after three warnings from the Supervisory Board" the expulsion from the Company. And no charges for life in the "Fascio de 'lavoratori Nicola Spedalieri": "All offices, recited the statute, both effective, both honorary, including those of the Director and Deputy Director, the Secretary and the Deputy Secretary, the Cashier and the Economer last for a year. The first Sunday of December we will proceed with the renewal of the offices and will take possession of them on January 1 ". Last note: in addition to mutual aid, the Statute also provided that "in case of death, the members should accompany the confrere to the cemetery preceded by the social banner".